Another Pinterest find. 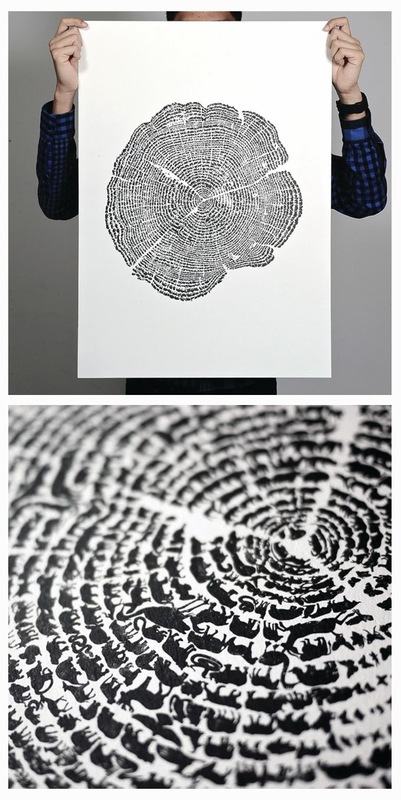 This poster sized print named 'Tree of Life' by Gary, Aaron & Khairul appears at first glance to merely be a 'rubber stamp' style, black and white print of a tree's cross section, but on closer inspection you can see that the rings are made up from the tessellated shilouettes of birds and beasts. It's meant to represent how the animals in the rain forest revolve around their living space, and aims to highlight that since animals are not able to speak for themselves, the destruction of their habitat leaves them suffering in silence. Ultimately that means that the resposibility of preseving nature or destroying it ultimately falls to us. This poster is available to buy here at Degree for $50 (and says it can be shipped world wide).